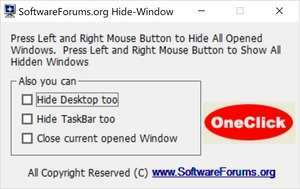 OneClick Hide Window helps you to hide all active program window immediately by click left&right mouse buttons. You can hide the browser windows, folder windows, applications windows, all windows in a flash time. Also by this software download you can shutdown all active program window in a flash time. Just download and try it, it's so easy to use, Just one click! For security reasons, you should also check out the OneClick Hide Window download at LO4D.com which includes virus and malware tests. Additional screenshots of this application download may be available, too. OneClick Hide Window has a presence on social networks.